This is a reproduction of a color oil painting by Charles Schreyvogel in the collection of the Tacoma Art Museum in Tacoma, Washington. Schreyvogel, like his contemporary Frederic Remington, based his portrayals of cowboys and cavalrymen on a combination of firsthand experience and masculine escapist fantasy. Between 1893 and 1905 he made frequent visits to the western states and territories, collecting Indian and military artifacts for the authentically detailed paintings he produced in his Hoboken, New Jersey studio. "The Last Drop" portrays a cavalry soldier and his horse in a quintessential Western desert landscape. 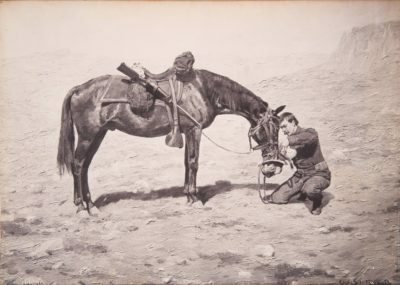 The soldier kneels before his horse, pouring the last of his water into his hat for it to drink. It is a rare scene of compassion and friendship in an archetypically hardened, loveless environment.